The AAM Competition Stage I Fuel Return System for the Nissan 350Z and Infiniti G35 is a direct, bolt-on kit that will convert a current factory ''return less'' fuel system to a full return fuel system. The Stock, ''return less'' system in the 350Z & G35 offers only minimal adjustment to the amount of fuel the engine requires for peak performance. The factory system is cheaper to mass produce and performs well with factory trim vehicles, but has several limitations if it is used with forced induction applications. One limiting aspect of the factory ''return less'' system is that the factory fuel pressure regulator is installed in the fuel tank. Further, the factory fuel pressure regulator does not allow precise fuel pressure adjustments and is not capable of maintaining constant fuel pressure with most aftermarket fuel pumps. The factory fuel pressure regulator does not increase fuel pressure when the engine is under boost. 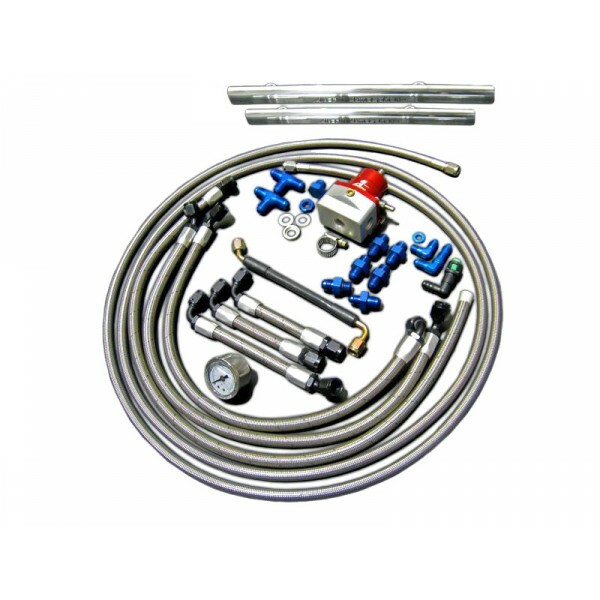 The AAM Competition Stage I Fuel Return System is a must have for any forced induction supercharged or turbocharged vehicle.. The AAM Competition Stage I Fuel Return System replaces the factory regulator's limited control of fuel pressure with a vacuum or boost sensitive adjustable fuel pressure regulator. This allows you to adjust and set both the level of base fuel pressure and increase fuel pressure that is delivered when under boost. (About one pound of fuel pressure increase for each pound of boost pressure). 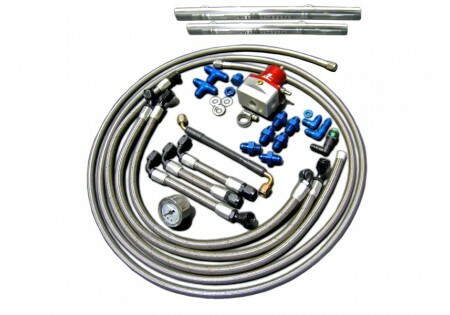 Our bolt-in kit is a direct replacement and upgrade to the stock, factory fuel system. Included is a High Performance set of AAM Competition CNC Billet Aluminum Fuel Rails with a 500% flow improvement over stock, a complete set of -AN stainless steel lines and fittings, fully pre-assembled and pressure tested to greatly reduce installation time, a boost referenced fuel pressure regulator, and precision fuel pressure gauge.